Winds are coming out of the southwest at twenty to thirty miles per hour with gusts up to fifty miles per hour. The National Weather Service reports that winds will increase in speed from the mid-morning to mid-afternoon with the highest speeds coming in the afternoon hours. Be on the lookout for scattered tree and power line damage along with some minor property damage caused by the highest gusts. The NWS said that winds as strong as the ones blowing Friday could make driving difficult, too, especially for high profile vehicles. 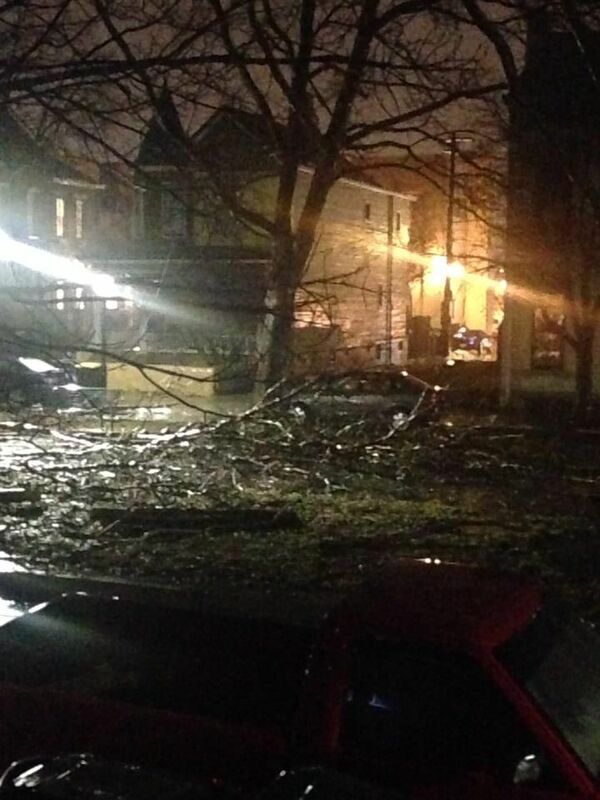 Winds took out a big piece of a tree on the Sixth Street Promenade in Mainstrasse Village late Thursday night. These photos were submitted by readers Amy Myhaver and Brian Goldberg. A wind advisory is issued when sustained winds are forecast to be 31 to 39 miles per hour or gusts will range between 46 and 57 miles per hour. FRIDAY Sunny, with a high near 45. Breezy, with a west wind 16 to 25 mph, with gusts as high as 45 mph. FRIDAY NIGHT Partly cloudy, with a low around 34. Southwest wind 10 to 16 mph. SATURDAY Mostly sunny, with a high near 56. Southwest wind 11 to 15 mph. SATURDAY NIGHT Mostly cloudy, with a low around 32. West wind 6 to 9 mph becoming north after midnight. SUNDAY A chance of rain and snow before 2pm, then a chance of rain. Cloudy, with a high near 41. Northeast wind 7 to 9 mph. Chance of precipitation is 30%. New precipitation amounts of less than a tenth of an inch possible. SUNDAY NIGHT A slight chance of snow before 10pm. Mostly cloudy, with a low around 21. Chance of precipitation is 20%. MONDAY Mostly sunny, with a high near 37. MONDAY NIGHT Mostly cloudy, with a low around 23. TUESDAY Mostly cloudy, with a high near 34. TUESDAY NIGHT Partly cloudy, with a low around 19. WEDNESDAY Sunny, with a high near 31. WEDNESDAY NIGHT Partly cloudy, with a low around 16. THURSDAY Mostly sunny, with a high near 29.